For the past 8 weeks I have been learning all about the ins and outs of YouTube and monetising videos, so thought I would share the information I have learnt with this 'How to Monetise' guide. YouTube allows anyone to monetise their videos, providing you are not breaking any copyright rules, ie not using someone elses video or someone elses music, this means you must have the right to distribute everything in the video, no background music, no 'mash up' of other peoples videos no singing along to your favourite songs or recording of computer games or TV programs. Once you are happy with the videos you have uploaded and you are sure they do not break the community guidelines you can choose to enable monetization. This is done simply by clicking the 'enable' option in the youtube settings. Once you have enabled your account, you can individually select videos to monetise. 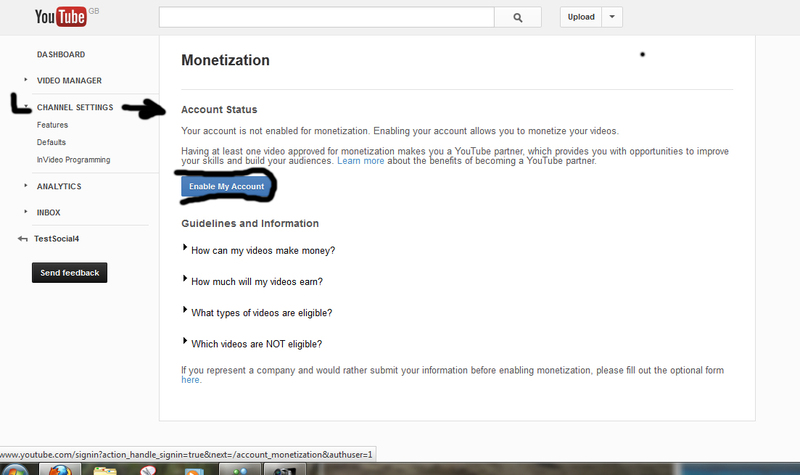 You can find the settings for each individual video in the video manager section, or you can set the monetization settings as you upload each new video. When you look at the individual video settings, you will see the monetization option under the preview, highlighted with number 1 in the screen shot below. When you click on the Monetization tab, you will see there are two types of adverts you can choose from, (highlighted with number 2 above), click so you can see a tick next to the advert style you require. Overlay in video - these are the slightly transparent ads which pop up along the bottom of the video. TrueView in stream - these are the adverts which play at the start of the video which viewers can skip after so many seconds. You can also select both styles of ads, by ensuring a tick is in both options, when this is the case YouTube will change which type of advert is displayed, depending on who and where the video is viewed. Once you have selected to monetize your video you should notice a green $ icon (highlighted with the number 3 in the above screenshot.) 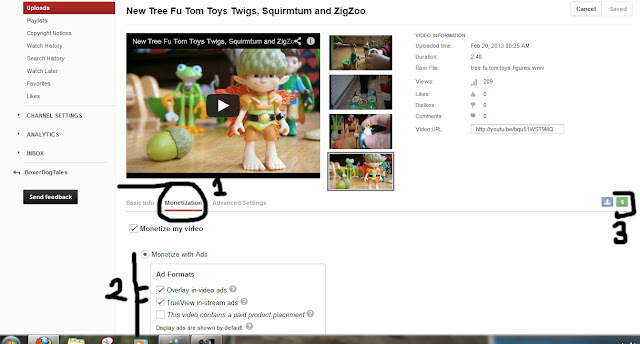 If the green icon is a dull green then it means the video is being checked to see if is ok to monetise, if the icon is grey it means it is not monetised yet. 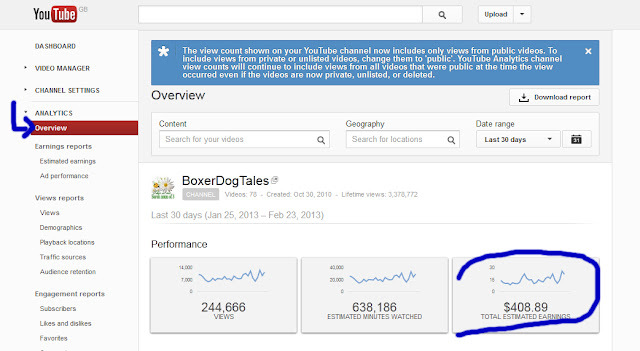 After you have ads running on at least one of your videos you will start to notice an 'estimated earning' figure in your analytics section. To connect Adsence to youTube, you need to click on the 'monetize' option in the channel settings, Here it will either directly say you need to 'Associate an Adsence account' or it will show a series of questions as shown in the screen shot below. Which informs you that you will be redirected to Adsence. 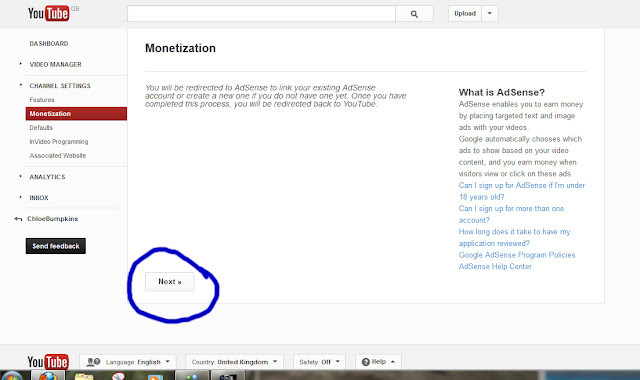 You need to click Next and then follow the instructions to set up your Adsence account. If you already have an Adsence account you must use the login information for your current Adsence account, NOT your login information for the youtube account you are setting up, if you don't currently have an Adsence account then you can create one using your current YouTube/Google sign in information. 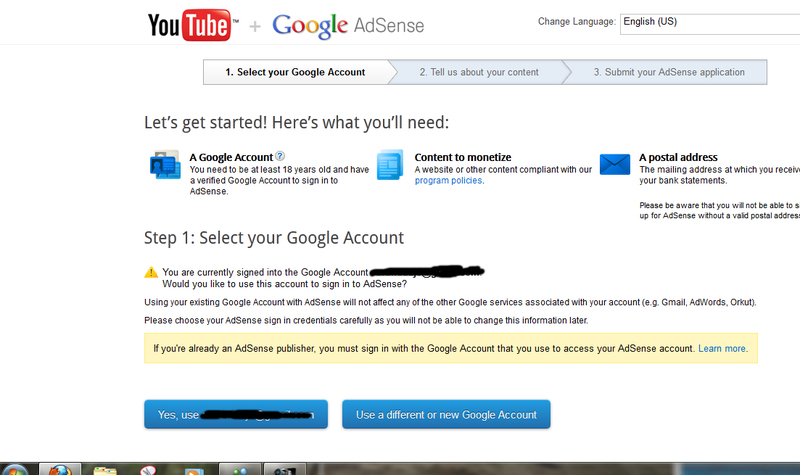 It is important to note you are only allowed ONE adsence account, per person, but you can connect several YouTube channels, blogs or sites to it. So if you, like me, have your blog, Google+ and YouTube all using different sign ins, be sure to set your Adsence log in to the one you will most readily remember. 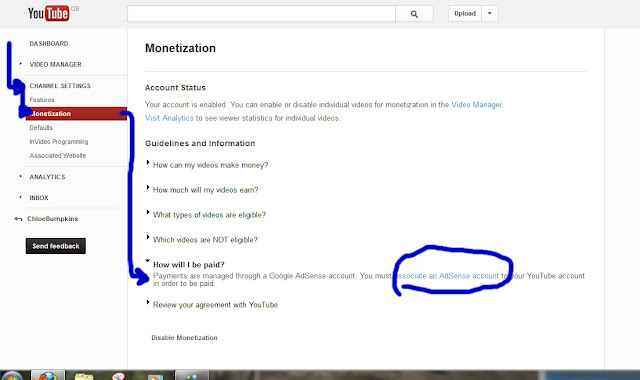 Once you have associated your Youtube account with Adsence, then you can check how much you have earnt by logging into Adsence and seeing the balance. Adsence has a threshold you must meet of £10 before you can update your bank information, and verify your address details, then you must reach the £60 limit before payments can be issued. Payments will not be issued until you have verified your bank details, address and telephone number. To verify the address details you have to input a PIN number into your Adsence account which is sent to your postal address, which takes around 10 days to arrive after it is processed to be sent. So if you earn £100 during January, you will receive the payment before the end of February. If you don't meet the payment threshold in January any earnings will be carried over into the following month, until your balance is above the threshold. If you also have a blog you can easily add Ads to your blog with adsence too, the total from YouTube and your blog adverts will be added together in your Adsence account. I hope this helps, I will be doing some more YouTube tutorials on the little bits of information I have learnt about helping to get your videos found in the coming weeks so look out for them, and if you have a YouTube channel, be sure to pop over to my channel and say hello and subscribe and I will be sure to subscribe back! What i was going to say was, i have two channels. One is six years old and has 70 000 views. I'm not surprised not to have received any money from that one. The other one, however, has almost half a million views and is around two years old. Both are long since verified, linked to Adsense, have not violated any intellectual property or other terms of service and so on - everything, so far as i can tell, has been done right. I have, however, not received any money for them. I am puzzled by this, but that wasn't the main point i was going to make. My main point is that this needn't be a problem! On the strength of my channels, i have sold books, ebooks, given consultations and been able to tutor via Skype. In fact, i suspect that i've made a lot more money that way than i ever could've done via Adsense monetisation, and wanted to make the point that ads are not the only or even the best way of making money from YouTube. Having said that, i am still, on an intellectual level, puzzled regarding why i haven't received any money from YouTube. I am thinking, though, that if i ever do get a cheque from them i may make a video of me shredding it so i can dramatically demonstrate that there are many other ways of deriving an income. In fact, the cheque might be worth more to me that way than its monetary value. Thanks for commenting Mark, you make a very good point, same as with blogs, there are alot of opportunities which can come your way as a result of blogging, not just the obvious ads and review prodcts, as for your youtube, it is odd that you haven't received any money from your account, are they both linked to the same adsence, and when you sign in to adsence does it show anything at all? 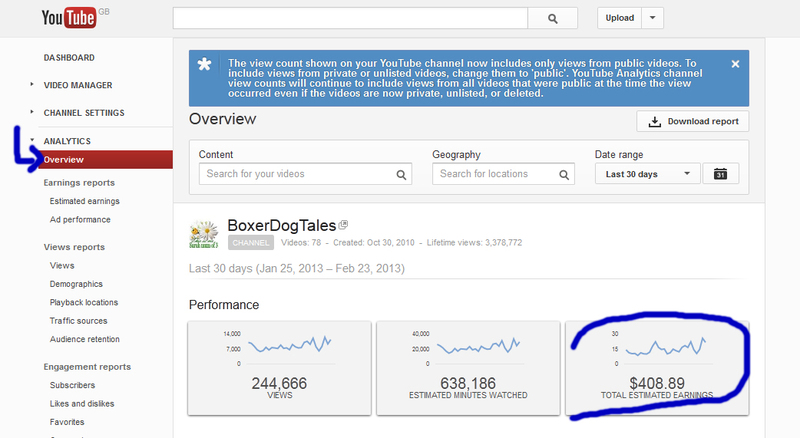 do you have the 'estimated' figure in our youtube analtics? Everything money wise is directly through adsence, so it sounds like that might be where your problem is? I will presumably work it out in the end. The estimated figure on both has always been zero, and yes they are linked to the same Adsense. I vaguely wondered if it was to do with viewers not clicking on ads. I do, however, wonder if it's worthwhile although i'm happy for Google to keep the money from the ads because they need to keep the site going somehow, so i think it's the responsible thing to do, just as a repayment to YT/Google for people to monetise. I presume there are people who are unable to do something like sell merchandise, use their channel as a "shop window" for services and the like, and for them the problem would need to be resolved if they want to make money, but for my channels it's not much of an issue. For instance, i got a consultation worth £30 out of one four-minute video which took me maybe an hour to make, edit and upload, and had got, i dunno, maybe ten views up to the point i got that consultation, and if i have the figures right, that'd make it worth about a penny! Also makes sense in terms of time investment as at the minimum wage that'd be less than seven quid of work. Regarding the blog, well, i've resigned myself to the fact that it just ticks over and won't make any money so i mainly use it to showcase videos and stick educational materials on it. It's a running joke on there that nobody reads it, as you've seen. its great that you can get work via the videos instead of the ads, I think in the long run that sort of work is worth so much more than the few pound per ad revenue, which average viewed videos will bring in, like you say if your videos spark a responce in someone to want to hear more about what you do then you don't need the thousands of hits to make some money you just need one person whos intrested, where as to make money via the ads you do need thousands of hits, yes youtube is massive and if you get lucky your videos will get seen, and they can easily be seen thousands upon thousands of times... but i am still undecided if thats just a matter of luck and a following mentality, coparred to actual video brilliance! I think once you get past a few hundred views more people will click out of curiosity about why hundreds of others have viewed the video, more than the fact the video is great to watch.